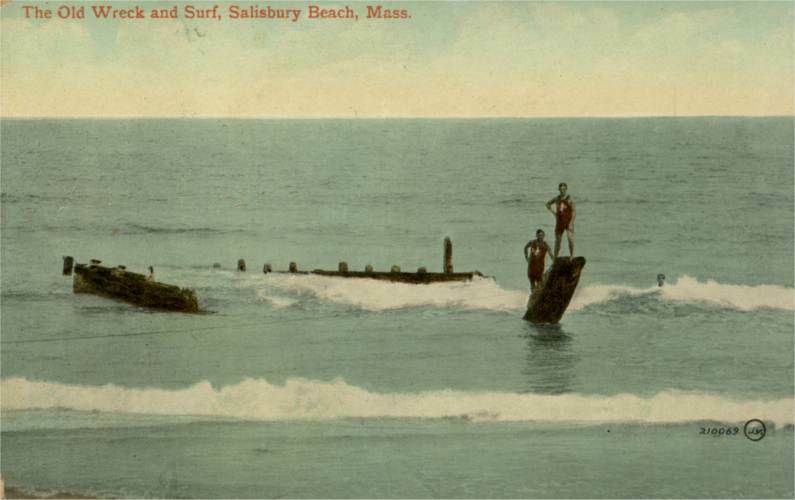 ﻿Salisbury Beach, like many coastal towns along the shores of Massachusetts, was the site of a tragic shipwreck. The Jennie M. Carter, a three-masted schooner en route from Rockland, ME to NY with a cargo of heavy stone encountered a nor'easter in April 1894 and became lost in violent seas. After losing a rudder and foretop mast in Ipswich, it forged on before running aground a few days later in Salisbury. The Carter was built in Newton, MD in 1874. She had a gross tonnage of 296.22, length of 130', breadth of 35' and depth of 10'. Wesley T. Ober (Captain) ~ His body washes ashore near Knobb's Station, Plum Island on April 19. Captain Ober's remains were sent to Sedgwick, ME to be interred with his father. J. W. Preble (Chief Mate) ~ His coat comes ashore on April 23. In it is a letter from West Harrington, ME dated 18 Dec 1893.
? Crowley (Steward & Cook) ~ His brother, Captain A. L. Crowley of East Boston states the captain's niece had made the trip. It is later discovered there were no women on board. Sven Sigfred Petersson (Seaman) ~ His is the first body to come ashore. He is Swedish, 25 years old and has only been in America a few years. 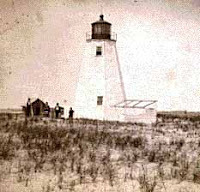 10:00 a.m., Tuesday, 10 Apr 1894 ~ The Carter is sighted by the schooner Smuggler off Highland Light. Her rudder is missing and her jibboom, bowsprit and fortopmast is gone as well. The Smuggler lay by for two hours, but Captain Ober is confident that he can reach land without assistance. The Smuggler sails away. Later, the new yawl of the Carter is discovered near Sandy Beach by Patrolman C. M. Noyes of the Plum Island Station. The handle of the gripsack is found tied to the gunwhale of the boat, indicating someone has put his belongings in the yawl as if an effort has been made to reach shore. Keeper Elliot of the Plum Island Lifesaving Station does not concur in this theory ... believing instead that all the crew was gathered at the anchor in an attempt to lower away when a great wave came over the side and threw every man overboard. ﻿Friday Morning, 13 Apr 1894 ~ The Carter is seen drifting along Salisbury beach opposite the end of the plank road by Mr. Fowler, a resident of Hampton, MA. There does not appear to be anyone on board. An hour later ~ The lifesavers at Plum Island Point sight the Carter just as she's going aground. The station crew, who are just sitting down to breakfast, spring up, don oilskins and rubber boots and launch their lifeboat. Crossing the harbor, the surf boat proceeds up Black Rocks Creek to the scene of the wreck. Meanwhile, Fowler and a companion have followed the Carter along the beach. When she grounds, they wait a short time before climbing up her chains to her deck and confirm there is nobody on board. About an hour later, the lifesavers board the Carter. Surf man Phillip H. Creasley discovers that a clock in the cabin is still going. When he tosses it overboard, the time registers 10:25 a.m. Also taken ashore is the compass, the ship's papers and quadrant. 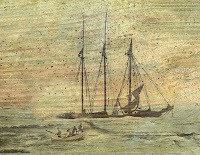 By this time, the Carter's back is broken by her heavy cargo of paving blocks and there is no hope of salvaging her: the Carter had been carried directly over the Breaking Rocks Ledge where the Sir Francis had hit in 1873, then drifted ashore opposite the present site of the old Ocean Echo, a dancehall of the period. Throughout the morning, there are reports that every member of the Carter's crew has reached shore safely and has been taken up to Hampton Beach Hotel. It's soon discovered that nobody from the wreck has been seen at the Hampton, or anywhere else. Friday Afternoon, 13 Apr 1894 ~ By now the seas are washing off the deck houses. The mizzenmast has fallen and other masts fall during the evening. A large crowd, many of them disorderly, have gathered on the beach to watch the Carter break up. 23 Apr 1894 ~ The great cargo of paving stones is sold at auction. 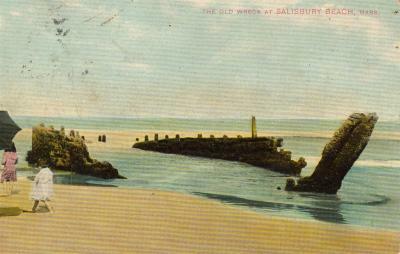 Crowds continue to go down to Salisbury Beach to review the remains of the wreck which, until 1956, showed a few blackened fragments of her keel at unusually low tides during times of a full or new moon. 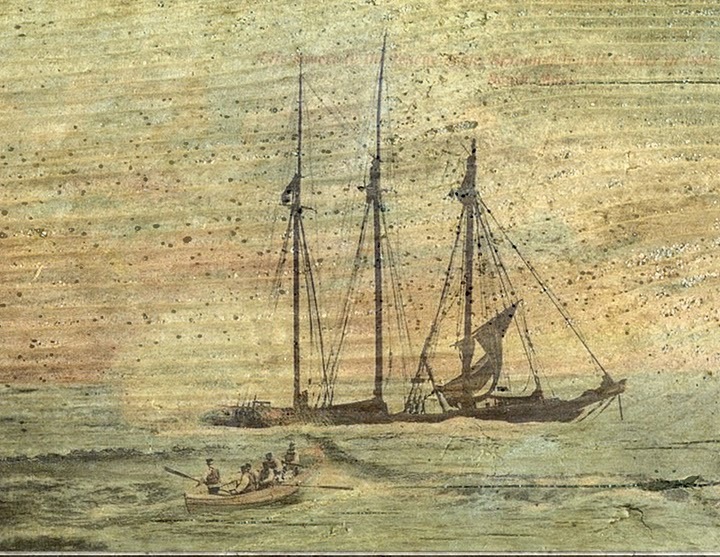 Wesley True Ober in 1841 in Tremont, Hancock, ME and died at sea bet. April 10-13, 1894. He was the son of Addison Ober and Lydia M. Robinson. (After Addison's death, Lydia remarried to George Gott). Judi Heit is a history buff who has been doing genealogical research for over 40 years. 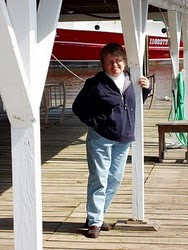 She and her husband, Ralf, live in Oriental ~ known as the Sailing Capital of North Carolina.